by John Sander, VP Technology, Lubrication Engineers Inc. Simply stated, viscosity is defined as the internal resistance of a fluid to flow. That doesn’t sound too difficult, does it? Unfortunately, new temperature, speed and pressure demands on lubricating fluids have changed over the years, resulting in several different measurements and classifications being created to describe lubricant viscosity. Some examples are SUS, cSt, cP, ISO, SAE engine, SAE gear and AGMA; it’s enough to make a person’s head start to spin. This paper will summarize some of the more commonly used viscosity standards, describe the tests used to measure viscosity, and eliminate some of the confusion all of these standards may create for the end user. In recent years, some large lubricant marketers have run advertisements on TV that highlight the importance of viscosity breakdown. These advertisements make it seem like viscosity is a complex chemical property of the fluid, when in fact it is a measurement of a physical property. Simply stated, viscosity is a measure of a fluid’s internal resistance to flow. A good example of this was provided in one of the TV ads, which showed two oils being cooled until one continued to flow out of the bottle readily, while the second dropped out in blobs. The resistance to flow, or viscosity, of the second oil had increased dramatically with the decrease in temperature. This ad illustrated just how important it is to consider viscosity when choosing the proper lubricant for a specific application. The presence of viscosity information on almost all lubricant marketers’ technical literature is an indication that it also is important in the marketing of lubricants. Original equipment manufacturers often specify the lubricant to be used in their equipment by product type and viscosity. Lubricant marketers usually sell their lubricants according to specific viscosity grades, such as SAE 15W-40, ISO 46 and AGMA 3. Viscosity determines the ease with which machines can be started in low-temperature conditions or can be kept running in high-temperature conditions. 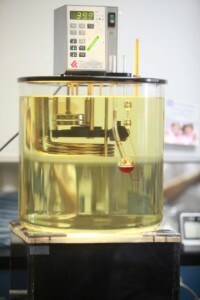 As mentioned above, viscosity is a physical measurement of a fluid’s internal resistance to flow. Assume that a lubricating fluid is compressed between two flat plates, creating a film between the plates. Force is required to make the plates move, or overcome the fluid’s film friction. This force is known as dynamic viscosity. Dynamic viscosity is a measurement of a lubricant’s internal friction and it is usually reported in units called poise (P) or centipoise (1 P = 0.01 cP). 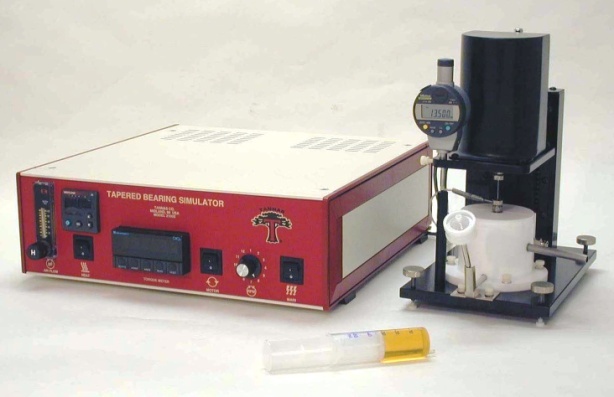 A common tool used to measure dynamic viscosity is the Brookfield viscometer, which employs a rotating spindle that experiences torque as it rotate against fluid friction. This test will be discussed in more detail later. A more familiar viscosity term is kinematic viscosity, which takes into account the fluid density as a quotient of the fluid’s dynamic viscosity and is usually reported in stokes (St) or centistokes (1 St = 0.01 cSt). 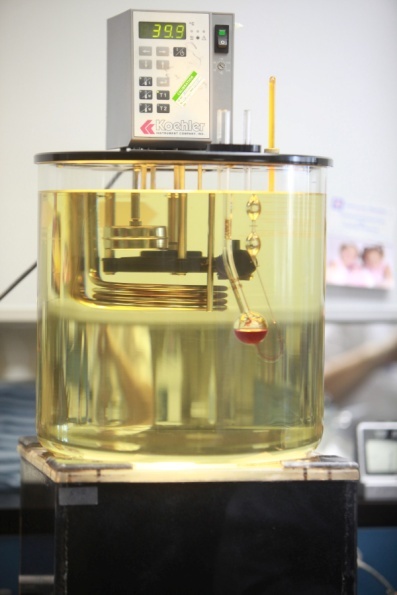 The kinematic viscosity is determined by using a capillary viscometer in which a fixed volume of fluid is passed through a small orifice at a controlled temperature under the influence of gravity. 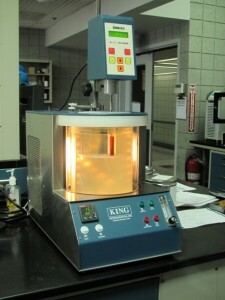 Grease viscosity, traditionally called consistency, cannot be measured using the tests noted above. However, it is still relevant for selection of the correct grease for a specific application. Greases are fluid lubricants enhanced with a thickener to make them semi-solid. They usually are used in applications where a liquid lubricant would run out. Greases are sold by consistency grade, which in this case will be used synonymously to viscosity grade. Grease consistency is measured using the cone penetration test. The National Lubricating Grease Institute (NLGI) created grade ranges for greases that have become the industry standard. These ranges characterize the flow properties of greases. Various conditions must be considered when specifying the proper viscosity of a lubricant for a given application. These conditions include the operating temperature, the speed at which the specific part is moving, and the load placed upon the part. One other consideration is whether or not the lubricant can be contained so that it remains present to lubricate the intended moving parts. 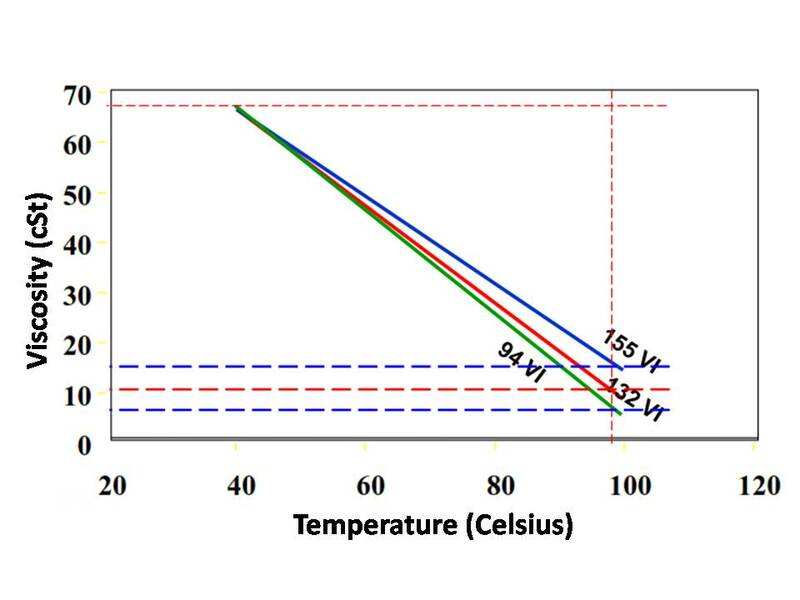 The viscosity of a lubricant changes with temperature – in almost all cases, as the temperature increases, the viscosity decreases; and – conversely – as the temperature decreases, the viscosity increases. To select the proper lubricant for a given application, the viscosity of the fluid must be high enough that it provides an adequate lubricating film, but not so high that friction within the lubrication film is excessive. Therefore, when a piece of equipment must be started or operated at either temperature extreme – hot or cold – the proper viscosity must be considered. The speed at which a piece of equipment operates must also be considered when specifying the proper lubricant viscosity. In high-speed equipment, a high-viscosity lubricant will not flow well in the contact zones and will channel out by fast-moving elements of the equipment. On the other hand, low-viscosity lubricant would have too low a viscosity to properly lubricate slow-moving equipment, because it would run right out of the contact zone. Equipment loads must also be considered when selecting the proper lubricant viscosity. Under a heavy load, the lubricant film is squeezed or compressed. Therefore, a higher viscosity lubricant is needed. The higher the viscosity, the more film strength the lubricant will generally possess. In addition, the load can be either a continuous or shock load. A continuous load is a steady load that is maintained while the equipment is operational, while a shock load is a pounding or non-steady load. Under shock-load conditions, a low-viscosity lubricant would not possess enough film strength to stay in place, whereas a high-viscosity lubricant could stay in place and act like a cushion in the contact area. In some applications in which a fluid lubricant would leak out, a grease might be recommended. However, it is still important to consider both the base fluid viscosity and the NLGI grade when selecting the proper lubricant. If the lubricant’s viscosity or consistency is too high, it might not flow where it is needed and the lack of lubricant – a condition known as lubricant starvation – would lead to metal-to-metal contact. This would cause wear that could ultimately result in equipment failure. The same thing could happen with a lubricant with too low a viscosity or consistency, because it might not stay in the area where it is needed. Fortunately for the end-user, various technical societies have created classifications that are used by lubricant manufacturers when formulating the proper viscosity grade of lubricant needed for their equipment. These viscosity classification systems are commonly used to describe both industrial and automotive lubricants. These standardized viscosity ranges are used by lubricant formulators, original equipment manufacturers and lubricant consumers when labeling, marketing, specifying and using lubricants. The Society of Automotive Engineers (SAE) has created two viscosity standards for automotive lubricants. SAE J300 is a viscosity classification for engine oils, and SAE J306 is for axle and manual transmission lubricants. The J300 viscosity grades and their requirements are summarized in Table 1, while those for J306 are shown in Table 2. In both of these classifications, the grades denoted with the letter “W” are intended for use in applications operating in low-temperature conditions. The “W” was originally coined for lubricants that were considered “winter grade.” Today, these products are formally called multigrade lubricants, whereas the grades without a “W” are recognized as monograde, or straight grade, lubricants. 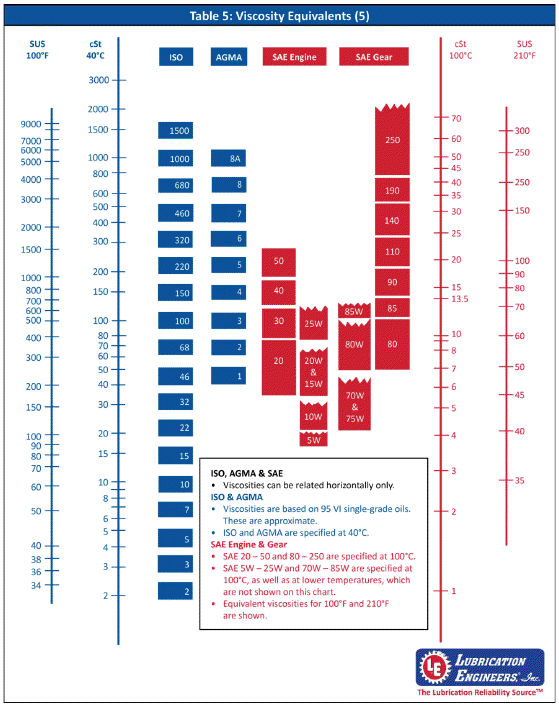 The American Gear Manufacturers Association (AGMA) has also created a commonly used viscosity classification system, which is partially based off the ISO VG system, noted in Table 4. The AGMA numbers let the user know the ISO viscosity grade and some basic information about the gear lubricant’s chemistry. If the product is a mineral oil that contains only rust and oxidation (R&O) additives, it will be recognized with only the AGMA number. If it is a mineral oil with extreme pressure additives, it is recognized with the AGMA number followed by the “EP” designation. AGMA numbers followed by an “S” denote synthetic gear oils. Compounded gear oils contain 3% to 10% fatty or synthetic fatty oils and are noted by the AGMA number with “Comp” after it. Some gear oils contain residual compounds called diluent solvents that are used to temporarily reduce the viscosity making it easier to apply. In this case, the AGMA number is followed by an “R,” which describes product prior to addition of diluents solvent. Now do all of these viscosity grades seem easier to understand? Okay, maybe not yet, so Table 5, a viscosity equivalent chart, provides a comparative illustration of all of the grades shown in tables 1 through 4. For example, the chart indicates that an SAE 50 engine oil and an SAE 90 gear oil are the same viscosity. This might surprise you if you think that gear oil is always thicker than engine oil. However, as Table 5 shows, they are nearly equivalent. As with anything, viscosity classifications have changed over time. As mentioned above, viscosity used to be commonly recorded in SUS units in the U.S. As the economy has become more global, different standards organizations have worked together to standardize units of measure, including viscosity units. Some older equipment is still in operation that specifies the lubricant viscosity in the older units. The OEM might designate it with SUS units, while end users might refer to it in “seconds,” e.g. 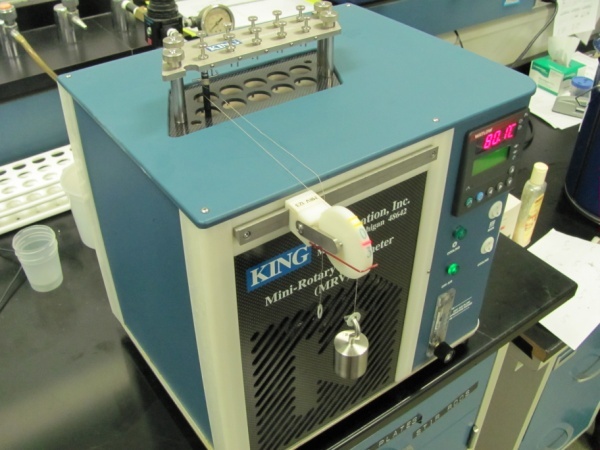 “I need a 100-second oil for this machine.” Fortunately, there are common conversions that can be used to estimate the cSt value from the SUS value. In some lubricant applications, it is impossible to contain a fluid lubricant. For these applications, greases are used. A simple description of grease is a semi-solid lubricant composed of base fluid, additives and a thickener. The thickener in grease is added in most cases to help keep the lubricant in place on applications where a fluid lubricant would run off and only provide lubrication for a very short time. Because greases are not a fluid, their resistance to flow is generally called consistency instead of viscosity. The NLGI created a set of ranges that have become the standard by which most greases are produced, marketed and sold. These ranges are based upon the ASTM D217 cone penetration test after 60 strokes of shear, described in more detail later. The NLGI ranges are listed in Table 6. The #000 greases have a runny consistency similar to cooking oil, while the consistency of #6 greases is similar to a block of cheese. The kinematic viscosity is then calculated by multiplying the measured flow time by the calibration constant for that viscometer. 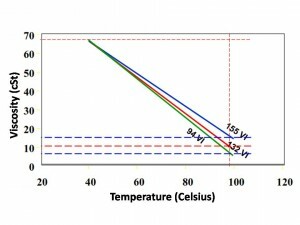 The viscosity is then reported in centistokes (cSt) at a given temperature. Because of its large volume and importance to so many consumers, the engine oil market drives many new trends that occur within the lubricant industry. 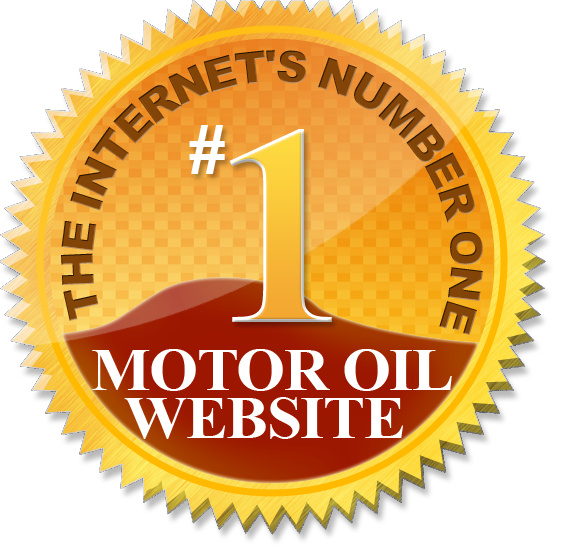 Today, articles are being written discussing the possible demise of monograde engine oils. (14) A number of years ago, straight grade engine oils, especially SAE 30 and SAE 40, were the most prevalent viscosity grades used by most consumers. SAE is considering adding either two or three new viscosity grades to the SAE J300 Viscosity Classification that was described previously. (15) The reason all of this is occurring is because much attention is being paid to improving fuel economy and energy efficiency. Governments are pushing automotive and industrial OEMs to find ways to improve the efficiencies of the vehicles and equipment they produce. It is not completely surprising that lubricants have been considered as a means to decrease fuel and energy consumption. As viscosity is a measurement of the internal resistance of a fluid to flow, if the viscosity is decreased, then so is the internal resistance. Therefore attention is now being paid to decreasing the viscosity of various lubricants to reduce their detraction from efficiency. Improved efficiency results in less energy consumed, which results in lower emissions released into the environment. Due to the improvement seen through the use of multigrade engine oils, studies have now been done that suggest that the same energy savings can be realized through the use of multigrade or synthetic industrial lubricants. (16) The majority of the work has been done in hydraulic fluids, which not surprisingly, is the second largest category of lubricants by volume. In fact, one additive supplier has set up a Web site specifically to describe how viscosity can affect hydraulic system efficiency. (17) This supplier has coined the term “Maximum Efficiency Hydraulic Fluids,” a concept for which it won the 2010 American Institute of Chemical Engineers Energy Efficiency award. So far, the products discussed have been fluids. What about greases? While energy efficiency studies may not be as easy to conduct and prove for greases, new viscosity-related research is occurring to better determine how greases will flow when used in an application. In fact, ASTM subcommittee D02.G has various active research projects, including some related to grease rheology. Rheology is the study of the deformation and flow of materials. Not surprisingly, this definition sounds very similar to the definition of viscosity. 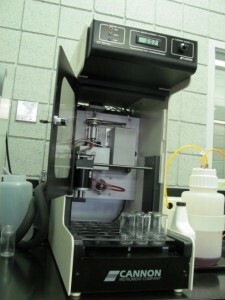 Much of this research is being conducted employing a tool called a rheometer. A paper has been published in which rheometer data has been compared to grease penetration data. (18) The rheometer provides a new level of sensitivity above and beyond that of the penetrometer. One last area of interest is the viscosity of used oils. Analyzing used oils is not new, but analyzing them under high- and low-temperature operating conditions is new. How will the effects of oxidation, contamination and shear affect the performance properties of the lubricant? A working group at ASTM has been formed, and it is planning a symposium to be held in the future to present research related to rheology (viscosity) of in-service lubricants. Lubricant viscosity or consistency is a physical measurement of a lubricant’s internal resistance to flow. It can truly affect how the lubricant will function in a piece of equipment. Fortunately, organizations like ASTM, SAE, AGMA, ISO and others have created standards for lubricant viscosity and consistency that are to be used as guidelines when selecting the proper lubricant. If the wrong lubricant viscosity is selected for an application, the chances for equipment failure are dramatically increased. Therefore, the best rule is to always check the original equipment manufacturer’s manual for lubricant viscosity recommendations. If the OEM makes no recommendations, then the next step is to consider the operating speed, temperature and load of the application to be lubricated. 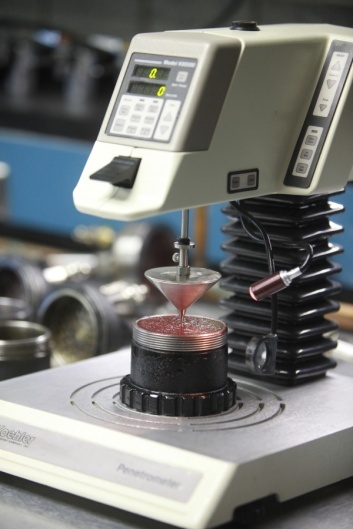 Finally, after making a lubricating product selection, it is important to 11 © 2011 Lubrication Engineers, Inc. closely monitor the equipment to ensure the right choice was made. If possible, visually observe the moving parts to verify that a sufficient lubricant film is present to protect them. If not, listen for any unusual load grinding, chattering or squalling noises, which often are indications of metal-to-metal contact. Finally, one last technique is to contact lubricant manufacturers for recommendations. They often can provide technical support for proper fluid or grease selection. Very simplistically, viscosity is a measure of a lubricant’s physical resistance to flow, yet it is probably the most important property of a lubricant. SAE J300 “Engine Oil Viscosity Classification,” Society of Automotive Engineers, Warrendale, Pa., 2009. SAE J306 “Automotive Gear Lubricant Viscosity Classification,” Society of Automotive Engineers, Warrendale, Pa., 2005. ISO 3448:1992 “Industrial Liquid Lubricants – ISO Viscosity Classification,” International Organization for Standardization, Geneva, 1992. ANSI/AGMA 9005-E02 “Industrial Gear Lubrication,” American Gear Manufacturers Association, Alexandria, Va., 2002. “Viscosity Equivalents,” Lubrication Engineers, Inc. Wichita, Kan., 1984, revised 2011. NLGI Lubricating Grease Guide, 5th Edition, p. 34, National Lubricating Grease Institute, Kansas City, Mo., 2006. ASTM D2983 “Brookfield Viscosity,” ASTM International, Conshohocken, Pa.
ASTM D445 “Standard Test Method for Kinematic Viscosity of Transparent and Opaque Liquids,” ASTM International, Conshohocken, Pa., 2010. ASTM D2270 “Standard Practice for Calculating Viscosity Index from Kinematic Viscosity at 40 and 100°C,” ASTM International, Conshohocken, Pa., 2010. 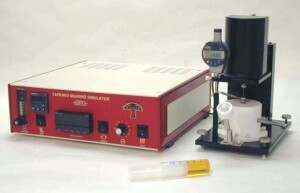 ASTM D4683 “Standard Test Method for Measuring Viscosity of New and Used Engine Oils at High Shear Rate and High Temperature Using a Tapered Bearing Simulator Viscometer at 150°C,” ASTM International, Conshohocken, Pa., 2010. ASTM D4684 “Standard Test Method for Determination of Yield Stress and Apparent Viscosity of Engine Oils at Low Temperature,” ASTM International, Conshohocken, Pa., 2010. 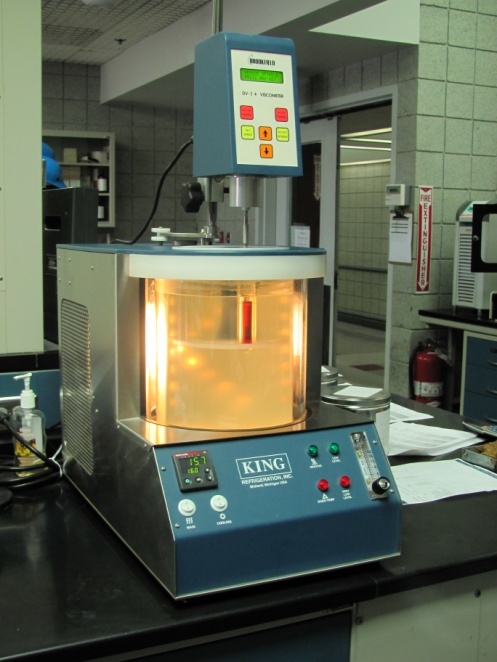 ASTM D5293 “Standard Test Method for Apparent Viscosity of Engine Oils and Base Stocks Between -5 and -35°C Using Cold-Cranking Simulator,” ASTM International, Conshohocken, Pa., 2010. ASTM D217 “Standard Test Method for Cone Penetration of Lubricating Greases,” ASTM International, Conshohocken, Pa., 2010. Swedberg, S., “Who Needs Monogrades?” Lubes’n’Greases, LNG Publishing Co., Inc., January 2011. Swedberg, S., “Are you Ready for SAE 5W5?” Lubes’n’Greases, LNG Publishing Co., Inc., December 2010. Casey, B., “Hydraulic Oil Can Make a Major Difference to Power Consumption,” Machinery Lubrication, Noria Corp., Tulsa, Okla., Jan-Feb 2011. “Evonik Rohmax USA Receives AIChE Energy Initiative Award,” www.mehf.com, accessed March 11, 2011. Johnson, B. “The use of a stress Rheometer in lieu of cone penetration,” presented at an NLGI meeting.